Because I'm adamant and addicted to searching and chasing watches, there's a number of watch buying scenarios I dream about... One of those opportunities is spotting a watch on someone's wrist, in public, striking up a conversation and buying it off their wrist (yet to happen). Another long shot chance occurrence I daydream about is spotting a great watch lumped in a junkie watch lot. This would be akin to finding a gem slumming in the dollar bin at a thrift store. Who doesn't want to find something this way? Adding watches to my collection by stumbling on them means I never what my next watch will be or when I'll get one... That's O.K. I'm in the meantime I'm happy as a clam wearing the watches I have. When I do get a hit on great watch, the thrill I get trying to reel - and pulling it into the boat - is worth the wait. Below is the story behind my latest find. I recounting of the events, the players, my decision-making and emotions, which come with every vintage watch I'm been lucky to own. I employ a variety of methods to get leads on watches. (like advertising "Buying Old Watches" here on my website). Most of the time I end up replying back with something like, "Thanks for your message, but unfortunately your watch isn't quite my style. Please keep me in mind if you come across any old watches..."
This latest outreach was destined for the same gentle let down. The first watch was TIME magazine-branded (not exactly Tiffany & Co. or BEYER). Because you just never know... I swiped my iPhone screen to see the others while my son swiped alphabet magnets off the fridge. I saw more of the same. Watches with quartz hearts and gold-plated cases - the likes of Kurz, Lord Madison and Aseikon... All shot in the dark on a shellacked coffee table. But then I saw it. My thumb came to a screeching halt. It was the second to last photo. Time stood still for a few seconds. 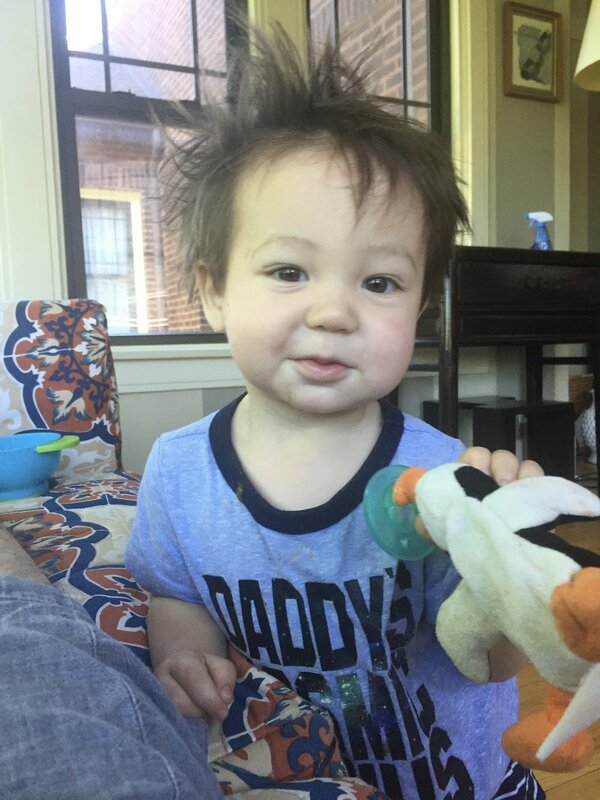 At this point I lost all track of my son. He could've been eating dirt from one of the plants. I instantly recognized the three button silhouette and those long lugs. It didn't matter that the camera flash washed out the dial. It was at least a reissue - a sweet find. I've always admired Carreras from afar. Actually from not too far away. My closest watch friends Rob @bazamu, Andrew @t_swiss_t and Justin @justinvrakas all have amazing Carreras with some good stories how they found them. Before me was my chance to own, to experience, what Rob, and many, call, "the best sports chronograph ever made." As I zoomed into the blinding glare I could tell this wasn't a beat up '90s reissue, it was a survivor '60s icon. All you really had to do was look at the strap to know it was fifty years old. The "rally" style strap was full of "cheese" as another good buddy of mine, Greg @agedpatina, calls the grime often accompanying these neglected treasures. Like it takes a village to raise a child, it takes your most-trusted watch friends bring home a watch like this. Not that I doubt my skills, but it's nice to have "Phone-a-Friend" lifelines. So, before I shot back a reply text, I sent Rob, Andrew and Justin the photo, "Ok... you ready... look what just got offered to me..."
Before valuing their expertise (especially in the Carrera department) they're my sounding board to green light my strategy how to engage the seller so I can close deal. I'm glad to have these 3 in my pit crew, helping me and cheering for me. But I was the one driving. It would fall on me to take the checkered flag,or in this case, hoist what looked like an original, unpolished 2447S. I didn't expect him to drop everything and fire back a new round of pics. So how did I pass the time? Oh right, I have a son around here somewhere... we had some real breakfast, eggs, then hit the couch for some YouTube ABC sing-alongs. At least an hour had gone by and still no pics... I have a strong sense I'm the only one he's messaged. I just need to be patient. But as I'm stacking blocks with my son, I also making mental plans to get this watch - TODAY. Why does it have to be today? Let's just say opportunities like this don't come around often. The fact that I've yet to see a second photo, haven't talked to the seller, don't know if he can meet today and haven't talked price doesn't stop me from believing I'm getting my first Carrera TODAY. I called the seller and was greeted by a voice younger than I expected. First thing I said was I apologize if he hears a baby making Teradactyl sounds in the background. Next I asked about the watches. Like how did he get them... I learned his dad passed away and among the personal effects left to him were these watches. Watches his dad inherited from his dad (Grandpa). Before I knew it, we were making arrangements to meet, even before we came to terms on a price for the lot. About the rendezvous, it couldn't have worked out more perfect. I really didn't want to cut my day short with my son. We have playgrounds to go to and neighborhood puppies to pet. I asked him how much he wanted for them all. Like often happens, he turned the question around and asked how much I'd pay... I had a number in mind, I made my offer, and he said something like, "yeah I can do it for that..."
Mama's home from work. Time to kiss the fam goodbye and head out! I'm three hours from getting my first Heuer (although I really don't know what exactly I'm getting). Once I'm buckled in to the driver's seat of our Su-baby-ru, I text the seller that I'm en route and give him my ETA. The whole way there my mind is racing. I'm imagining what it will look like in person. Remember, making the arragements, making my offer, was based on what I saw, which wasn't much. I could see enough to make an offer taking the worst case into account. I wasn't setting my expectations too high. I was totally prepared for a silver, sunburst dial with dark green lume. I really hoped the dial didn't have road rash. hoping not a flip I wanted it to be a keeper. I've been tolerating FM Radio for over two hours, constantly scanning for stations playing a decent tune or that even come in (much of the haul I'm surrounded by farmland and wind turbines). The sun has set and it's about to get real. I text the seller that I'm on schedule. Apple Maps says I'm an hour away from the Starbucks he's chosen. He's texts back to let me know he's on his way there now. Pretty soon they'll be no camera flash, no sun, between me and this Heuer. I'll see it for myself. The wonder and mystery of the past twelve hours will become reality. As I'm exiting the Interstate I call my wife to find out if our son is knocked out or bouncing off the walls (I'm praying he's being good boy as I feel a little guilty leaving them). Really I call her to be on the lookout for a text shortly - from me - that everything went fine. This isn't my first rodeo meeting someone at a Starbucks to exchange an envelope of cash for a watches. I park the car and look in my rear view mirror. The hatchback isn't jumping out at me, so I call. The seller picks up and says he saw me pull into the lot. Next thing I know I'm grabbing my satchel from the passenger seat and shaking the hand of a guy in his late twenties/early thirties wearing an orange, mesh safety vest. I make small talk as we head into the Starbucks. The door is locked - they're closed. With no table to sit down at, where do we turn? How about the rust-spotted hood of his car. That's where it happened. 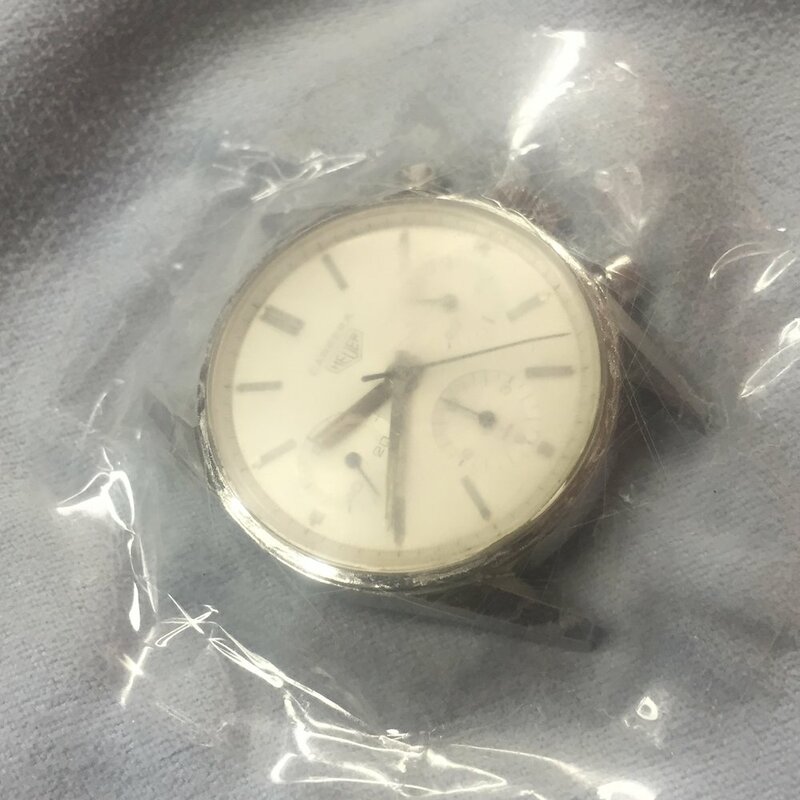 He pulled out a dusty Ziploc bag with the six watches jumbled inside, clanging together. He proceeded to sprawl them out, showing me that each watch was there just like in his pictures. Of course I was interested in only one. 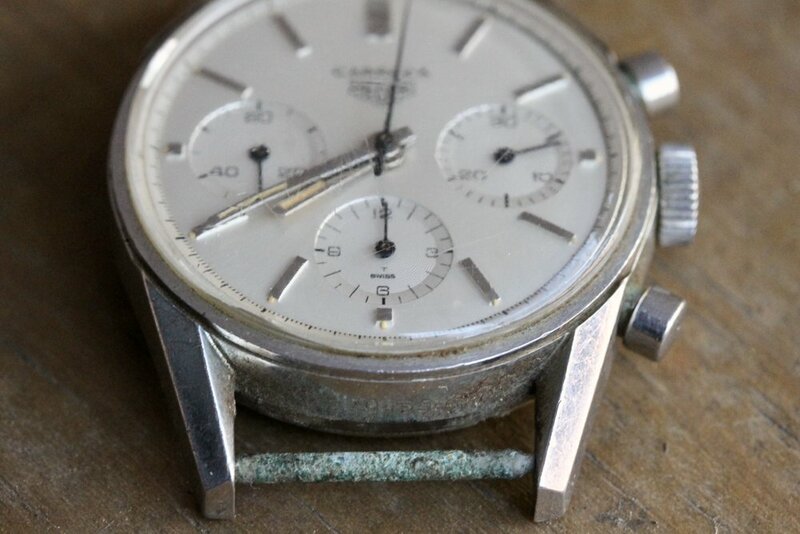 When the Heuer first came out it was caseback up, the crystal rubbing against his hood. I still couldn't see the dial... Then he flipped it and I laid eyes on it... This time the light shining on it was from the light pole directly overhead - a little better ambiance than a harsh flash or bright sun. I took a quick glance and saw a dial that is at the very least good. I didn't hold it close to examine the lume or anything (I didn't dare pull out a loupe.) My next move was handing over the dough and to bag everything up as he counted it. In the car, with the doors locked, is where I first really looked at it. I texted Rob, Andrew and Justin, "Damn it looks amazing, Yellow lume!" Next stop was McDonald's across the street to take quick pics. Before I went in, I played with it a little. I wound the crown gently. After hearing and feeling a few smooth micro clicks, the subdial second hand came to life. Next I pulled the crown and set the time. Then I tried the chronograph... The start/stop pusher actuated crisply and the chrono second hand sprang into action and stopped on a dime. Rob: "Damn man, that's an unbelievable example. Insane. It's a keeper." Justin: "Sick. Looks completely unpolished and all original. So happy you got a Carrera"
I just filled up my tank, ready to start the drive home. After literally ripping that decayed rally strap off the spring bars, I'm wearing it on a black nato. I can't take my eyes off it under the florescent glow at the pump. My phone is vibrating like crazy as the boys chime in on my find (I'm glad I could provide some entertainment that evening. It's a Monday night after all). I'm finally home (and my luck continues as I actually find street parking next to our place). The trek back was mostly pitch black, so I couldn't ogle my Heuer the whole way home. I did however glance from time to time to check the time. And each time I searched out that curved minute hand, it was dead on to the time my iPhone said. I had a beauty and it was working! Well almost... The only issue I encountered so far was when it came to reseting the chronograph. Not the end of the world. When I held my son that morning I showed him the Carrera and said, "we did it!" I'll forever remember that day off with him. I'm so glad he's part of the story behind this watch. Eventually I took it out to the back deck. (As any WIS knows, natural light is best to check out and appreciate a watch.) Even through a heavily scratched crystal, I could see the dial was 99.5% flawless. Only four microscopic specs of debris will need to be dabbed off (flaked lume? dust?). The biggest "issue" cosmetically is some missing lume in the minute hand (which I'm planning to leave that way). Despite the wonky chrono, and partially flaked-out minute hand, there was no debate my watch was a gem... The debate that raged on was whether my dial was silver or "eggshell." I think the main reason it was up for debate is the dial has no "sunburst" pattern. It's more matte/semi-gloss. In my very limited "research" most silver dials are darkish and have a distinct grainy, sunburst pattern. That's why several commenters on my IG posts proclaimed it an eggshell dial. (Also not helping matters is depending on how/where the picture is taken it can look more white than silver). I believe it's a silver dial. I'll say this, I have a lot to learn about vintage Carreras. And now that I own one, you best believe I'll be studying up! I'm boarding a train to Milwaukee. I've only worn my Carrera once since getting it (Tuesday). Why? You see I haven't done anything to it at this point. No Polywatch, no wiping dirt off the case. I definitely haven't removed those spring bars, which look like algae-ridden shipwreck remains. Truth be told, I'm kinda enjoying beholding its "as found" condition. But after a few commenters on IG, and Justin, share that bars the likes of mine have been known to explode I got a little paranoid about wearing it. Not wanting to risk spring bar shrapnel damaging my lugs, I decided to leave well enough alone until someone qualified could cut them off. The person I trust, who's more than qualified, is Justin. This is who I'm going to see in Milwaukee. I'm not ready to send my Carrera off for service, as it looks fine and keeps time. I am however anxious to get it wrist ready, which means at a minimum properly cleaning the crystal and getting all the gunk off. Hard to believe it's the same watch in the photo texted to me. After Justin taped off the case he hunkered down to carefully sand the deep scratches out. I was fascinated by his polishing technique, which took almost two hours. All this done after he spent an hour plus chiseling and flicking dirt, sweat and corrosion off the case with toothpicks. Justin is a meticulous dude - from to how he does business to how he dresses. So I expected nothing less when it came to caring for my Carrera. 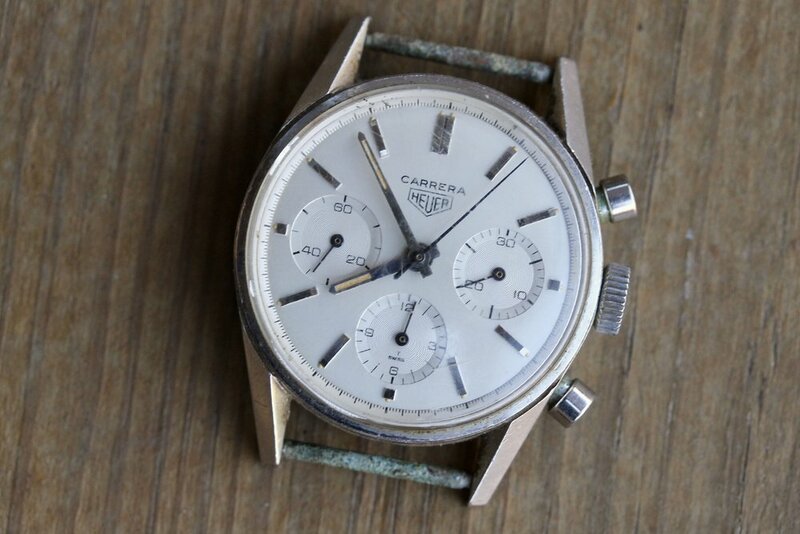 Once my Carrera was squeaky clean, the dial glistening under his jeweler's lamp, he unscrewed the caseback to take a crack at fixing the reset issue... What I'll describe as a puzzle-shaped part was dislodged. He thought it would be an easy fix, to pop it back down in place. Unfortunately, in the end, he found the stem it attached to had broken off. I'm not too worried about it. 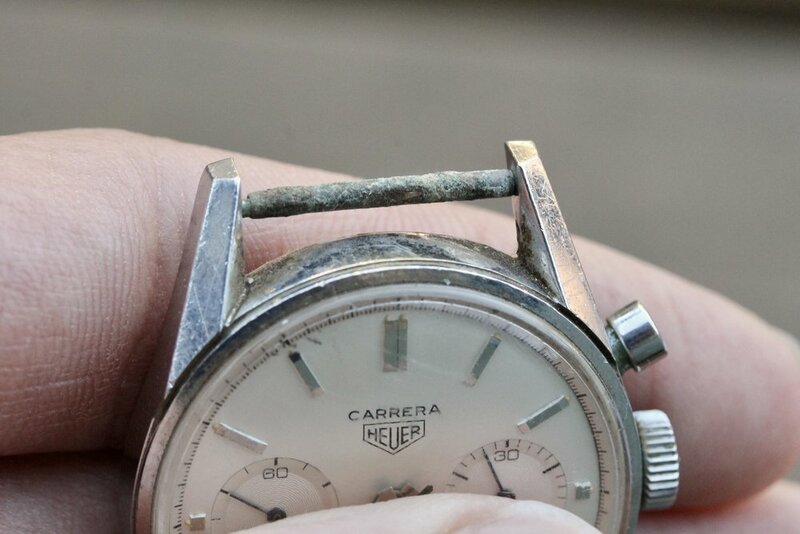 I'm confident a Heuer repair specialist can tear down the movement and a fix it with their eyes closed. In the meantime, the chrono works, except it doesn't reset. Driving back that night I couldn't help think how fitting it was that I found a Carrera outside of Indianapolis - a city with so much automotive history. After all the Carrera has its roots in motorsport, which is also why I couldn't help think it was fitting I had to drive to get it - over 400 miles and 7 hours.